Growing up in Southwest Ohio provided a diverse set of hobbies for someone living in the Midwest, but the one I grew most passionate about is one you might not expect. I had the option to play basketball at the YMCA, pursue horseback riding, join the swim team, try gymnastics (although that didn’t stick very well) and learn how to ski at Perfect North. My favorite sport, which is usually the most unexpected given the geographical location of my hometown, Lebanon Ohio, is sailing. Cowan Lake is located just 25 minutes north of my parents’ house and is home to the Cowan Lake Sailing Association (CLSA), a sailing club established in 1954 by a group of sailors with the mission to promote their love of sailing in Ohio. The club has grown to include over 130-member families, 12 recognized fleets and more than 250 boats. 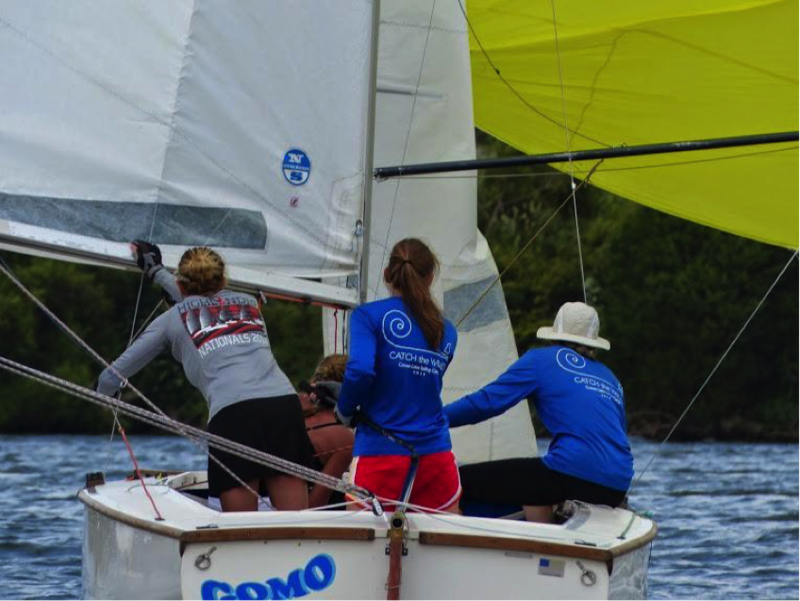 Each week, the club hosts member-run races that are governed by the US Sailing Association. Every summer, CLSA hosts a week-long sailing camp and recruits teenagers to work as camp counselors to lead the younger members. Both of my older brothers attended sailing camp ahead of me so when it came time, I was finally allowed to learn how to sail. After winning several fleet championships during my youth sailing career, participating in the Area E Sears Smythe Bemis competition and winning the first ever Women’s Betty Duncan Championship, I can confidently say that I learned how to sail in the Midwest. There are several important things to know about sailing in Ohio. First and foremost, one of the best parts about sailing is its sustainable nature. Little to no fuel is used to propel the boats forward because the boats are powered primarily by wind. Their reduced impact on the environment makes it an ideal sport. Sailors can enjoy speed and power without the cost of fuel and the solitude of being out on the water in a sailboat is uninterrupted by loud motors and the smell of exhaust. The cleanliness of the water and the health of the surrounding environment are both positively impacted by sailing. Without the use of fuel, water quality stays at high levels. Since Ohio is a “water-rich” state, with more than 166,962 miles of streams and 483,000 acres of wetlands, the less fuel that is leaked into our water, the better. Approximately one-third of the state drains to Lake Erie, while the other two-thirds drain to the Ohio River. With a reduction in fuel found in inland lakes due to sailing, there is less pollution in larger bodies of water. Helping to keep Ohio waterways free of pollutants also improves the flora and fauna in the area. Many of the sailing clubs in Ohio are in state parks and expose sailors to the wildlife of the region. Sailors can see over 430 species of birds including bald eagles, red tailed hawks, ducks, geese and waterfowl and observe these animals from a close but safe distance. Fish, reptiles and mammals can occasionally be spotted from sailboats and showcase the wide variety of wildlife found in Ohio. Sailing close to the shoreline allows sailors to observe the diverse species of trees found in the region including Sycamore, Beech, Ash, Oak and Spruce. Protecting these areas is something that sailors can tackle firsthand. Boating registration fees are deposited into the Waterways Safety Fund, which is used to operate Ohio’s boating program. Keeping boaters safe, and enforcing rules and regulations allows for the preservation of the environment. Maintaining the scenery and shoreline provides future generations with the chance to enjoy sailing. Another great aspect of sailing is that people of all ages can participate and enjoy being out on the water. Whether sailors are interested in leisurely cruising or competitive racing, there are sailing experiences to fit all ages. Sailing is a lifelong sport. I have interacted with people over the age of 80 who still love to rig their boats and head out to the water on a regular basis. Opportunities to sail are not as far away as you might think. According to the Inter-Lake Yachting Association, there are 90 yacht/sailing clubs in Ohio. Although most of the clubs are located on the shores of Lake Erie, several clubs are sprinkled throughout Ohio making the sport accessible to most Ohioans. Each club offers a unique experience and provides sailors with the opportunity to either rent sailboats or provide access points to get sailboats in the water. Sailing is a sport that has been around for thousands of years and has evolved from a mode of transportation into a pastime, hobby, lifestyle and sport that caters to all age groups. Whether you are a competitive sailor or just relaxing out on the water, sailing is a great way to get to know people in your area and expose yourself to the beautiful nature in Ohio. Dana Larison is a senior at The Ohio State University studying Strategic Communications. She is originally from Lebanon, OH and has 15 years of sailing experience. Dana is completing an internship with the OEC this semester.